This new approach to Thor is both refreshing and inspired. As you can see from the cover, Thor is no longer the Thor with whom you’ve grown familiar. Thor is now, well, a woman. A masked woman, in fact. By the time this volume rolls around, it’s already established that the new Thor is actually Jane Foster, a long time supporting character in the Marvel Universe and one-time love interest to the previous Thunder God. There are several reasons the Jane Foster Thor has completely won me over. The first reason is that the entire Marvel version of Norse mythology is being reintroduced to the reader as she gets to know it on a very personal level. As Thor, she’s more exposed to the gods than ever before, and it’s fun to see each Norse deity broken down to his or her most basic, and potent, element. 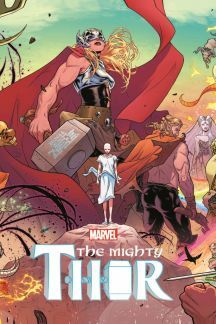 Consequently, I recently read Neil Gaiman’s Norse Mythology, and Jason Aaron, author of Mighty Thor, is actually staying true to quite a bit of the source material. Marvel has never claimed to exactly represent the Norse gods as they appeared in legend, if they did Thor would have been a lot different indeed, but Jason Aaron does accurately reference some rather significant moments from the myths of old. Another reason I’m captivated by Jane Foster as Thor is that she is always the underdog. She’s always having to prove herself, whether it be in debate, strategy, or battle. I imagine this could be considered representative of women in virtually all aspects of life, but in the case of this comic book, it’s a captivating recurring plot device. We are accustomed to the old Thor handling everything that comes his way. We know basically how he’s going to prove victorious and how he’s going to sound doing it. With Jane, though, everything old is literally new again. Finally, Aaron has upped the stakes significantly by killing Jane Foster every time she transforms into Thor. Jane is fighting cancer, but the cosmic power of Thor counteracts her chemotherapy which results in Jane getting worse and worse every time she wields Mjolnir. Foster is the epitome of valor as she chooses to help others while killing herself in doing so. This contradiction is fascinating, especially because Jane Foster is a charismatic character. I want her to be Thor, yet I also want her to survive. This dichotomy is incredibly captivating. Obviously, I love Jason Aaron’s writing. Not only does he seamlessly blend authentic Norse mythology into his Thor stories, but he also understands what makes dynamic characters, pacing, and plot. Best of all, he writes fluid, believable dialogue. In the comic book industry, it’s rare for a writer to do all of these things well. Also, Russell Dauterman, the artist, is fantastic. Like Aaron, he utilizes an amazing ability to make the Norse gods look like the gods of myth, yet he’s also made them modern and even, in most cases, futuristic. It’s a beautiful combination of myth, fantasy, and science fiction. Most importantly, though, he creates dynamic panels that push both the reader and the action forward. His drawings are detailed, well proportioned, well arranged, and his Thor is somehow the perfect combination of power and femininity. On that same note, he also manages to make Jane Foster physically frail while still retaining a power and fire within her eyes and body language. Honestly, I typically try to find something to critique in my reviews in order to offer some sort of objectivity, but with Mighty Thor I have no complaints. For me, this is a perfect volume, through and through. I can’t wait to read the next installment.